Mark your calendars for our Sizzlin' Santa Shop Hop on July 6, 7 & 8! 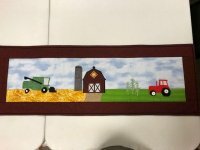 Each of the four shops, Colby Sew & Vac and Quilt Cabin in Colby, Smoky River Quilt Shoppe in Oakley, & us, Prairie Flower Quilts will have Jewel Tone kits available for a row by row project. Call or come by any of the shops for more details. 2017 "On the Go!" Row by Row Experience has Started! Create a quilt using at least 8 different 2017 rows from 8 different 2017 participating Row by Row shops and be the first to bring it into a participating shop to win a stack of 25 fat quarters (6-1/4 yards of fabric!). Bring your completed quilt to Prairie Flower Quilts shop and if it has P.F. Quits row in your quilt, win a bonus prize! Make our world a better place with The 9th Row. Many of the quilt shops are participating in The 9th Row project. In making a donation to The Make a Wish Foundation, the shops received an exclusive pattern. Consider the purchase of The 9th Row kit and a portion of your sale will help out the local children’s charity. Ask for it in your store! Remember - it is the 9th Row - you must have at least 8 other rows from 8 participating 2017 shops in your quilt to be eligible to win a prize.